This workbook contains information to gain knowledge about dementia. It is the first of a series of workbooks which are non-accredited resources available free to support those that work with people who have dementia. There are links within the workbook which direct you to other resources available to build on the knowledge given. Within the workbook, there are small exercises to help you to link your learning directly to your job. Please be aware of confidentiality issues and use initials only when describing people with dementia. The information is linked to the Qualifications and Credit Framework, learning outcomes for dementia, Knowledge and Skills Framework (KSF) and Common Induction Standard 7. Myth: ‘Dementia means you will become incapable of living life with any meaning’. This workbook begins by outlining some of the medical aspects of dementia in order to describe the effects and changes that take place. The challenge is to gain understanding that these changes do not prevent a person from continuing to live life to the full as we all hope to do, having both good, and not so good days, in our moment to moment experience of life. 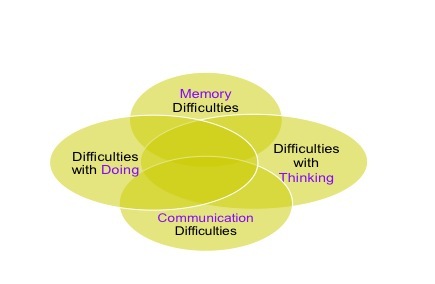 One of the important things to recognise about dementia is that it is more than just difficulties with memory. 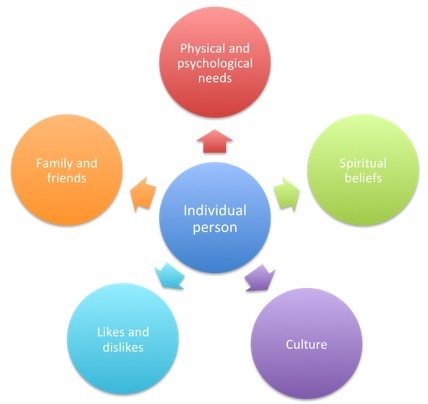 The diagram above shows how a person with dementia can have difficulties in a number of areas and all these affect each other, causing confusion and difficulty with everyday living. Dementia can be described as a person having a range of disabilities which can be more difficult to recognise than physical disabilities. Because of these disabilities a person’s ability to function in their usual way is affected as well as the ability to make decisions and judgements. Myth: getting older means you will get dementia.Dementia is the result of brain cells being damaged in an ongoing way. This happens as a result of a number of different diseases (sometimes referred to as ‘types’ of dementia). It is not an inevitable part of ageing. People with learning disabilities have a higher risk of developing dementia. It gives an opportunity to take medication which might help. There are some dementia medications which may slow down the course of Alzheimer’s disease. Currently these are Aricept, Exelon and Reminyl and they all work in a similar way. Recording advance statements and/or advance decisions (where the person with dementia sets out how they want to be cared for in the future, what should happen to their finances and other personal requirements for when they may be too ill to make an informed decision). Making Lasting Powers of Attorney for finance or welfare. Access appropriate care and treatment, including social services support and relevant benefits where appropriate. Awareness – a person may begin to notice problems, for example, forgetting things. Other people might notice the person not managing their life in the usual way. Assessment / diagnosis – a person may start to struggle with everyday living, needing prompts and reminders. As it becomes more obvious that the person is having difficulties this leads to assessment and a diagnosis. Getting a diagnosis can be difficult and it is estimated that currently only a third of people get a diagnosis (Source: Alzheimer’s Society). A person’s General Practitioner, and local memory assessment services should ensure people are screened, assessed and diagnosed. Living with dementia – a person will need increasing ongoing support in a number of areas around everyday living. But focussing on a person’s strengths and wellbeing is important throughout the course of the illness to help them live well. 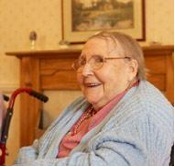 End of life care – keeping a person comfortable and pain free is the focus of care at end of life. 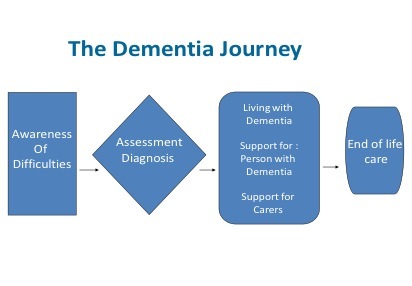 Making decisions about the care and treatment for the person with dementia needs to take into account the person’s best interests in consultation with the carers/family. Where a person has completed any form of advance care planning this can help decision-making. Using pain assessment tools can be helpful in determining appropriate pain management. 5. What does having dementia mean for a person? memories from the past can become more ‘real’ as difficulties increase. Throughout a person’s lifetime memories are built up so the person with dementia has a wealth of memories and information. However with dementia organising and accessing memories and information becomes increasingly difficult, affecting ability to manage everyday life in the usual way. losing track when undertaking a task with multiple stages. Task 2: In your notebook list 3 everyday tasks that a person with dementia may struggle with because of the difficulties with memory and thinking. For example, managing to pay household bills and money matters. Each person with dementia will respond to the difficulties they experience in an individual way due to everyone having different personalities. Recognising the feelings of the person with dementia and identifying what might be triggering these feelings will be helpful when working out how the person then responds. Task 3: Think of a time where someone you have known with dementia has been showing signs of one of the feelings above, and identify what might have been the difficulty that was triggering the feelings. For example, Joe was trying to do up the buttons on his shirt and he could not do this easily due to the difficulty in co-ordinating and working out how to sequence the task. This led to the feeling of being frustrated. In your notebook write down the difficulty the person was experiencing and try to identify the feelings that have arisen from this difficulty. Responding to emotional distress, expressions of anger and excessive walking. putting things in places where they cannot be found. Devon Partnership NHS Trust and Torbay Care Trust have produced a series of video clips on YouTube, which are helpful in understanding more about behaviours that challenge us. There are a number of factors that need to be considered when supporting people with dementia. It’s important to focus on the person rather than the illness. Rather than seeing dementia as the focus it is important to see and focus on the person. Each person with dementia will change and react to their difficulties in a different way. It is very helpful to know about a person. This will help to think about what the person could be experiencing. Finding out all about a person’s life is very important. Task 5: Think of a person you know who has dementia. Consider all the above areas. Download this document and use it to make notes about the person. Consider different sources for the information, talk with the person with dementia as well as family and friends. Remember to protect personal information and confidentially, use initials not full names. In your notebook list something new that you have learnt about the person you are describing which you found interesting. respect the person at all times. use gestures, objects or signals as well as words; for example show the person an object that relates to what you are saying. people who struggle to communicate verbally may be more sensitive to body language and may respond differently. A person who has delirium can often show similar symptoms to a person who has dementia. Delirium often develops quickly and is usually reversible. hallucinations and delusions are often present and come on quickly. They might hear, see or think things which are not ‘real’. severe confusion is often present. It is important to point out that dementia and delirium can occur together. Task 6: Can you think of an occasion when a person you have known has had delirium (toxic confusion)? In your notebook write down what happened and what was the cause. A person who is depressed can often show similar symptoms to a person who has dementia. ability to manage everyday tasks. Important note: A person may have dementia and also have delirium and /or depression. Treatment options need to be explored for depression and delirium. 2. Which of the following is a clear definition of dementia? 3. 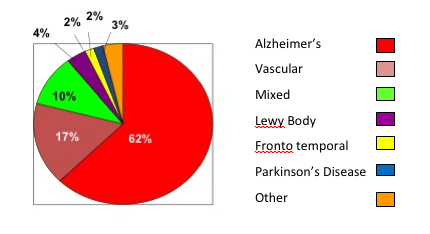 Which of the following is NOT a type of dementia? 4. Which of the following would NOT be useful in diagnosing dementia? 6. When a person with dementia appears unable to co-operate with care tasks which of the following is NOT likely to be a cause? 7. When supporting a person with dementia, which of the following are helpful? a) Allow the person time to respond. c) Use gestures, objects or signals as well as words e.g. show the person an object that relates to what you are saying.